Third generation Woodbridge baker, David Wright of Fire Station Café and Cake Shop Bakery in Woodbridge Suffolk has teamed up with DJ BBQ, aka Christian Stevenson, to transform David’s 73 year old family bakery and newer Fire Station café and coffee roastery into a multi-dimensional allday restaurant and cafe celebrating food cooked with fire - the best bread, coffee and wood-fired pizzas as well as Stevenson’s burgers and BBQ food. 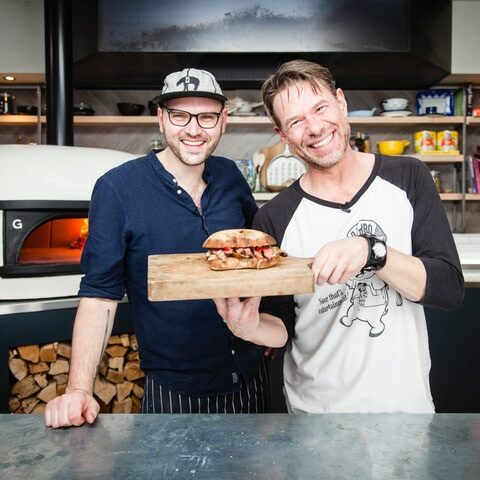 To achieve their dream, the pair will launch a crowdfunding campaign on Kickstarter to raise £75,000 on April 4th - the same day that DJ BBQ launches his third book, The Burger Book. Two of the most dynamic characters in food met at a festival in 2014 when Christian discovered that David’s brioche buns made the best burger buns he’s ever eaten and they struck up a great friendship. The goal is to raise £75,000 to kit out the new restaurant. Over the last 6 years over £300,000 has been invested in the Cake Shop Bakery and Fire Station giving them a great platform to build on. The majority of the investment will go on the new kitchen, the beating heart of the operation, providing new wall coverings, ovens and other equipment. It will also pay for new tables, and chairs, new toilets and two delivery bikes (one pedal pike and one scooter) so they can deliver wood-fired pizzas. The Cake Shop Bakery was opened by David’s grandparents in 1946 in a three-storey Victorian building and over the last few years has developed to ensure it meets the demands of today’s consumers. Rent and all the running costs including staff, energy, rates etc are covered by the business which means that 100% of the crowdfunding investment will go into the transformation. David and Christian have developed exciting rewards as thanks to anyone who invests in the campaign - from a limited edition badge by Lewis Heriz for £5 contribution, a shout out on DJ BBQ’s YouTube channel for £15, a Fire Station coffee subscription for £30, right up to a VIP launch party invite for £200 and 4 VIP tickets to Camp Bestival for £1000 and David and Christian visiting your house for a BBQ Cookout for 12 people for £3000.